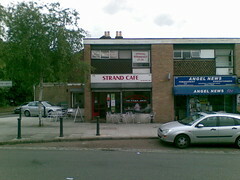 Cafe near [Kew Bridge]? in Chiswick. The cafe can seat about 20 people. Bob visited on Friday lunchtime and had egg, sausage, bacon, grilled tomato, hash browns, black pudding and a cup of tea for £6.90. Photo The egg was very good, the rest of it was fine. They are now advertising that they do Thai food on Thursday to Sunday evenings between 6pm-10pm. You can bring your own bottle. They also do takeaway. Last visited by Bob, 6 June 2008. Last edited 2012-02-11 00:01:37 (version 6; diff). List all versions. Page last edited 2012-02-11 00:01:37 (version 6).